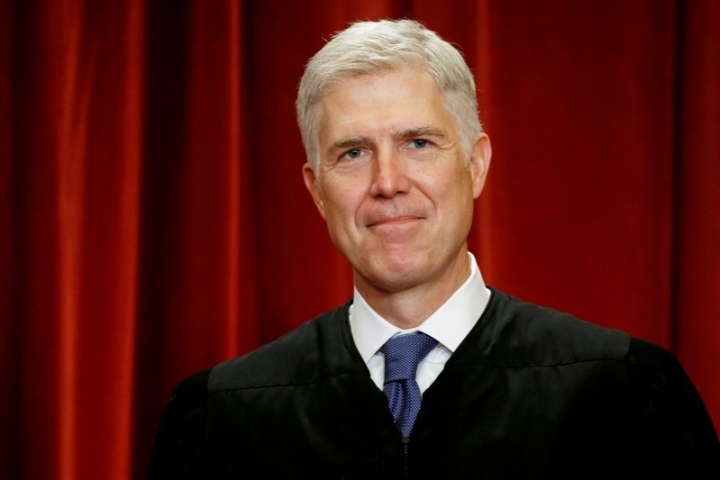 WASHINGTON (Reuters) - Eight months into his lifetime U.S. Supreme Court appointment, Neil Gorsuch has given every indication through his votes in key cases and remarks from the bench he will be a stalwart of the conservative legal agenda, as President Donald Trump promised. Still early in his career as a justice that could span decades, Gorsuch has already established himself as among the most conservative members of the top U.S. court, and has not been shy about expressing his views, sometimes in idiosyncratic ways. He also has made public appearances before conservative audiences, including a speech at the Republican president's Trump International Hotel in downtown Washington, that have drawn rebukes by liberal critics who questioned his independence from the president who nominated him. 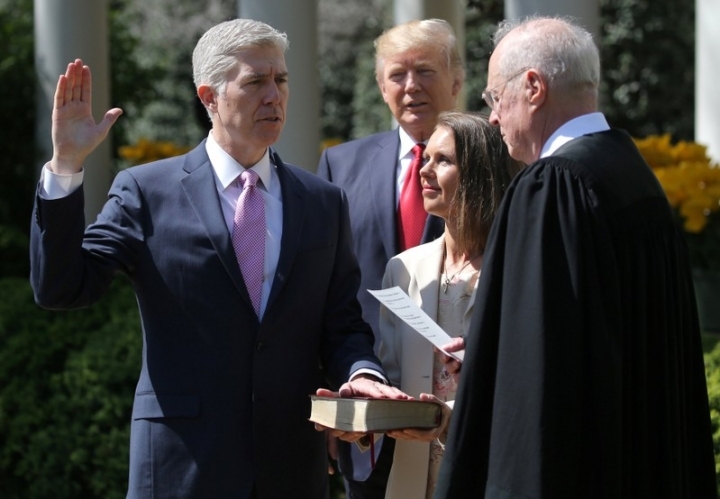 Gorsuch's record so far suggests "he is going to be a reliably conservative vote," said Carolyn Shapiro, a law professor at Chicago-Kent College of Law. Trump, who as a candidate promised to pick a justice in the mold of the late conservative icon Antonin Scalia, has set out to move the federal judiciary to the right. Gorsuch's appointment has been his biggest step yet toward that goal, restoring the high court's 5-4 conservative majority. 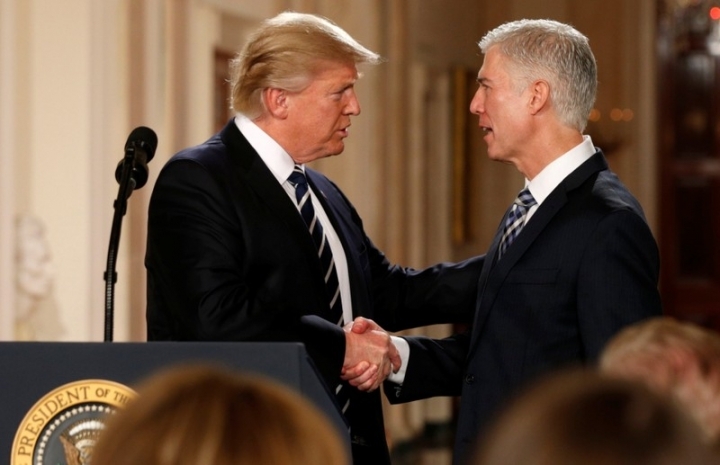 Gorsuch's April confirmation by the Republican-led Senate, despite strong Democratic opposition, provided one of Trump's biggest political victories since taking office in January. Writing about Gorsuch on Twitter on Tuesday, Trump said he was "very proud of him and the job he is doing," and rejected a Washington Post report that he had considered rescinding Gorsuch's nomination this spring after the jurist said attacks on the judiciary like those that had been made by Trump were "disheartening" and "demoralizing." The newspaper reported that Trump had vented angrily to advisers that Gorsuch may not be sufficiently loyal. Trump responded that he had "never even wavered." As the court rolls into 2018 with some big rulings ahead - on free speech, gay rights, voting rights and employee rights - legal experts said Trump will be able to rely on Gorsuch. The new justice has delivered key votes backing Trump's travel ban on people from several Muslim-majority countries and on the death penalty, and embraced certain kinds of public funding for churches. During arguments this month in one of the court's biggest cases of its current term, Gorsuch signaled sympathy for a conservative Christian baker who contends he was within his constitutional rights to refuse to create a wedding cake for a gay couple. Gorsuch declined an interview request for this article. Inside the Supreme Court chambers and outside it, Gorsuch, a 50-year-old Coloradoan, speaks his mind. "He is not intimidated about being the newest justice," said John Malcolm, a lawyer at the conservative Heritage Foundation think tank. Gorsuch has regularly sided with his fellow conservative justices. In the legal fight over the three versions of Trump's travel ban, Gorsuch sided with the president on four different occasions. In June, he was one of three justices who would have let Trump's second travel ban go into full effect. The court voted 6-3 to allow a limited version of the ban. On the death penalty, Gorsuch was among four conservative dissenters when the court in September granted a stay of execution for a Georgia inmate. In April, in his first recorded vote on the court, he was part of a 5-4 conservative majority that declined a stay of execution request from an Arkansas inmate. The court in 2018 is set to rule on two cases - one from Wisconsin and another from Maryland - involving the practice of drawing legislative districts in states in a way intended to entrench one party in power, known as partisan gerrymandering. The rulings could influence U.S. elections for decades. Based on the Oct. 3 oral argument in the Wisconsin case, in which Democratic voters challenged a Republican-drawn electoral map, it is unclear how the court will rule. Gorsuch used a culinary analogy to express his doubts during the argument about the Democratic challengers' legal theory. "It reminds me a little bit of my steak rub," Gorsuch said. "I like some turmeric, I like a few other little ingredients, but I'm not going to tell you how much of each. And so what's this court supposed to do, a pinch of this, a pinch of that?" During a November speech hosted by the Federalist Society, a conservative legal group, Gorsuch confidently touted his judicial ideology, stressing the importance of interpreting the U.S. Constitution based on its original meaning and narrowly reading the text of laws passed by Congress. "Tonight," he said to sustained applause, "I can report, a person can be both a committed originalist and textualist and be confirmed to the Supreme Court of the United States."